We are almost through the summer already and there have been many projects and activities involving TIM so far. These projects will, without a doubt, move TIM into the future. However, we continue to have responders injured and killed on our roadways; everyone must be vigilant and make sure that all responders are doing the right things. For TIM programs to continue to grow and to be recognized we must work to build the business case for TIM. As I stated in a previous issue, most police officers, firefighters, EMS personnel, and DOT personnel are typically not involved in building a business case. However, the private sector, such as the towing industry is very familiar with the need for this. If you can’t continually show the need for a business it is likely to fail. It is no longer enough for us to express the need for TIM based solely upon the obvious safety issues for our personnel. While those of us who are working at incidents on our highways every day understand the need, we must be able to “sell” the necessity of TIM to those who don’t work at these incidents. Even the best TIM champion is not able to accurately paint the picture of what it is like to have a close call on the roadways. While selling the necessity of TIM may sound like a daunting task, there are a number of tools at our disposal to help us accomplish it. These tools come to us in the form of Performance Measures. It is essential that those of us involved in TIM accurately track and document Roadway Clearance Time, Incident Clearance Time, and Secondary Crash data. By accurately capturing this data we can provide the economic impact and environmental impact of incidents. By providing examples of the cost of incidents, both in lives and dollars, and the savings that TIM can provide, we build a strong business case for TIM; but, it takes all of us. We must continue to provide accurate, timely information to communications centers, traffic management systems and in crash reporting. In areas where this data has been captured, the value of TIM programs and activities are obvious. This needs to be part of everyday practice, procedure and policy for all disciplines. We must be able to show the business case for TIM to continue the movement into the future. If we do this on all incidents, it most certainly will get done on the larger incidents. I am reminded of a familiar quote, “what gets measured gets done”. I have been involved in many conversations recently about the future of TIM. As has been seen with many champion based TIM programs, there are issues with transition when the champion is no longer there. This is why it is so important that we continue our work to institutionalize TIM. Traffic control and TIM training in police and fire academies, and in towing and DOT training programs, has not changed much until recent years. TIM training has found its way into some academies and training programs, but we still have a long way to go. I often have said that the program will sell itself, however this process has been slow. For TIM to gain more national and formal recognition, we must continue to promote it at every opportunity. There is not a day that goes by that I don’t speak to someone and promote TIM. I hope that you all will do the same. I do know that there are at least two of us that have voice mail messages on our phones that promote TIM. Such an easy way to get our message out to our contacts. And, it costs nothing. In the next few weeks there will be information sent out regarding the 2017 Traffic Incident Response Week activities. The theme this year is, “We’re All in This Together”. This year, Traffic Incident Response Week will be the week of November 13th through 19th. On Sunday, November 19th, there will be a Moment of Remembrance for Road Traffic Victims that will coincide with the World Day of Remembrance. There will be much more to follow. Please plan on participating these events in your area. As I have asked, please pass The Responder along to at least one person and encourage them to join. All of the programs from around the country are extremely important as they continue to promote TIM. Remember to forward information about your programs, best practices, training and other information for inclusion in The Responder. We are always looking for information from all disciplines that will benefit us all. Please contact me if you have questions or would like to provide information for an article. Please be safe as you work to make our highways safer. Take care of your partners, make sure that you have their back. Make a commitment to work closer with all responders in your area to improve the safety of all personnel, and promote the training of all personnel daily as you do your jobs, no matter the discipline. Remember, the goal is for everyone to go home at the end of the day, every day. You all set an example for the public when you are working. Make sure that it is a good example. On Sunday, August 27, 2017, the American Towman Spirit Ride made a stop in Kansas City to pay tribute to Blake Gresham, a tow operator who was killed on I-35 in Kansas City on August 27, 2012. Rusty James was asked to speak on behalf of the Gresham family, and the towing industry. Blake was killed by a driver who was under the influence of marijuana and did not slow down or move over. The Spirit Ride is designed to draw media attention to Move-Over laws and the needless sacrifices towers and other first responders make in serving the motoring public and transportation industry. The towing industry is taking to the streets to promote highway safety and help safeguard the lives of fellow first responders. The Spirit Ride will relay a ceremonial casket by car carrier across the nation and back. 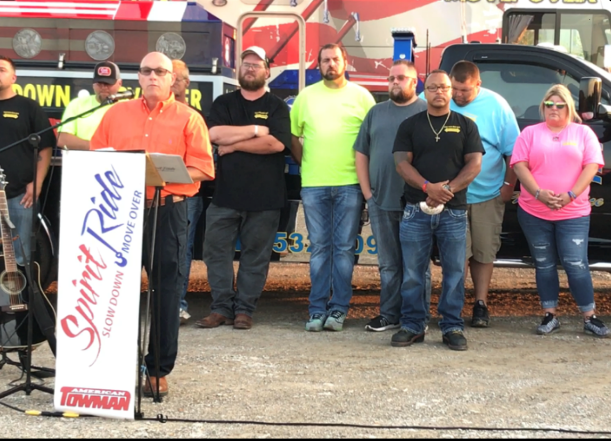 About 300 towing companies across the U.S. are contributing their services to the Spirit Ride to promote safe driving and the Slow Down, Move Over law. The ceremonial casket, named Spirit, was custom built by Mike Corbin, a carpenter who is also a lifelong singer-songwriter. Mike composed the Spirit Ride’s anthem. The casket was custom painted by Cecil Burrowes, an artist who specializes in painting trucks and wreckers. The colorful ceremonial casket, is at eight feet, a stretch farther than a standard casket. Painted on it are a dozen scenarios depicting first-responders at the scenes of highways incidents. Most laws include emergency vehicles, DOT maintenance vehicles, tow trucks and other vehicles with lights on. Some only include emergency vehicles. Some don’t specifically cover tow trucks in the language. There is confision on the part of motorists across the country. What was thought to be so simple has become so complex. Rusty James is recognized as a dedicated supporter of the towing industry, of which he is very proud. Rusty spends a lot of time promoting the towing industry, the need for strengthening relationships with all responders, and the need to protect tow operators on the roadways. In addition, the towing industry is seldom included in transportation planning, TIM planning, special event planning, or other areas as much as they should be. Towing is as much a part of Transportation Operations as any other discipline. Rusty told those in attendance that he dreams of a day when we all work together as part of a big team that is only interested in doing the right things for the right reasons. A team where the hat that you wear doesn’t matter, and no one even knows the rank or title of the other members. We’ll get there, he is sure of it. While promoting public awareness of the Move Over laws, the Spirit Ride at the same time honors first responders who’ve been killed by passing vehicles. Hundreds of roadside professionals are casualties each year of roadside incidents; about 100 of them are killed. Among police, fire, EMS, DOT and towing professionals, 60% of those killed are tow operators. According to Rusty, this is because tow operators are often out there by themselves. Many times, it is because they are abandoned by law enforcement, fire, EMS, DOT or others who should all be part of our team. This has got to stop. It is not intentional, it is the way we have always done things. We can’t afford to lose any more of our family. There should never be a time in our country when towers should be left alone working on our roadways because they were abandoned by others. It can’t happen. As an example, Rusty explained that, in law enforcement, fire, EMS, DOT or you name it, we are all comfortable picking up the microphone and asking for tow trucks; and the trucks just appear. But how many tow operators feel the same ability to ask your dispatcher to call the PD, FD, DOT or others and ask them to send a crew out to provide you some protection while you finish up? We must get there, and soon. Rusty told everyone that there is something that troubles him in the field of TIM. Many responders have seemed to forget the lost lives that we have experienced because of working in what we know is an inherently dangerous environment. Many have forgotten the best practices that have been developed and provided during training. Short memory. He went on to say that he sees police officers standing on the traffic side of cars on congested, high speed, roadways on traffic stops. He sees fire personnel and EMS personnel working in locations without blocking vehicles in place to protect them as much as possible. And he sees tow operators using the controls on the traffic side with their back to traffic. Approach vehicles on the roadways on the non-traffic side whenever it is possible. This is not just for law enforcement. Use the controls on the non-traffic side. Ask for back-up when in a dangerous location. This can be due to congestion, location, circumstances, etc. Don’t turn your back to traffic or lose focus on the big picture. He challenged them to be the example for the towing industry that you would like to be; be the example that everyone respects. There were over 100 tow operators, fire personnel, EMS personnel and others in attendance at the event, and the event was covered by the local media. Check below for the latest edition of the Oregon TIM Trend Newsletter!